Even though it is advised that you get your dentures refitted if you come to the realization that they are loose in any way, it is a whole lot cheaper to just seal them firmly in place with denture adhesive. For the most part, the use of denture adhesive is entirely safe and effortless, just as long as you’re using the right products. In this respect, let us point out that there are quite a few denture adhesives out there to choose from and that you cannot expect all of them to be just as efficient. You can expect a decent denture adhesive to help you keep food from getting under the dentures, to allow you to chew tough foods easier, to relieve the stress of dry mouth/bad breath, and to relieve gum irritation overall. With the right adhesive, you also won’t have to worry about the many health risks that some dental creams tend to cause. With that in mind, let us take a look at the ten best denture adhesives the market has to offer in our quest to better understand what decent adhesives are all about. Free from zinc and safe to use, the Effergrip Denture Adhesive Cream provides a stronghold and grip and is of a much higher quality than most adhesives in its price range. Approved by the ADA, this popular denture adhesive is made from high-quality ingredients and is extremely reliable. Guaranteed, to keep your dentures in place, even while chewing on the toughest food, this adhesive is super strong and aims at keeping out food. Before placing the dentures, however, always remember to rinse mouth thoroughly and to hold the dentures in place for 30 seconds so that the cream can set properly. The Cushion Grip Thermoplastic Denture Adhesive is a premium grade product that holds dentures in place for up to 4 days with a single application. Made from high-quality ingredients and safe to use, it works great on all kinds of plastic and porcelain plates. Thanks to its special formula, it eliminates slipping and does not wash off with water. Unlike most of its kind, this adhesive also works great with old dentures, giving you the comfort and support you need. 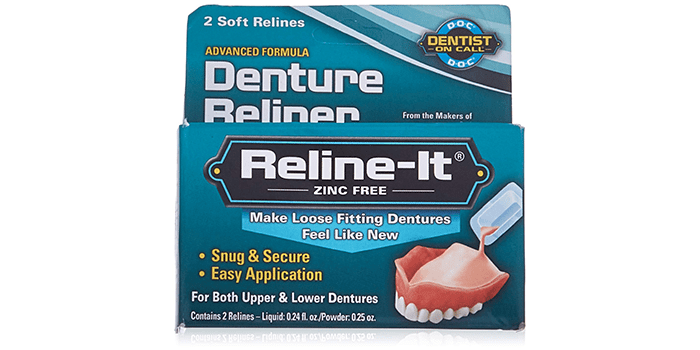 The Reline-It Denture Reliner is a premium grade adhesive that instantly fits loose dentures, giving you a snug and secure hold. Suitable for both the upper and lower dentures, it is super easy to apply and is budget friendly. Thanks to its unique formula, it is crafted with high-quality ingredients and is free from zinc. Approved by the ADA, this product offers a cushion-like, soft and comfortable grip and does not cause any discomfort to speak of. 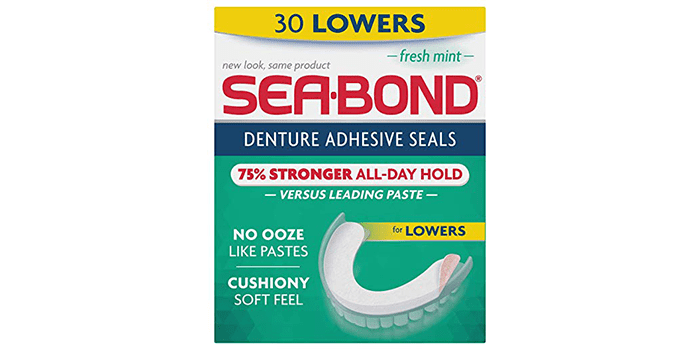 Providing a strong and comfortable hold throughout the day, the Sea-Bond Secure Denture Adhesive Seals are unlike any other pastes or creams of its kind. Free from zinc and extremely safe by most standards, this adhesive seal offers a cushion-like, soft feel and is entirely taste-free. With a 75% stronger hold that others of its kind, this adhesive is easy to use and is mess-free. Available in a minty-fresh flavor, this premium quality denture adhesive will give you that added confidence you need. 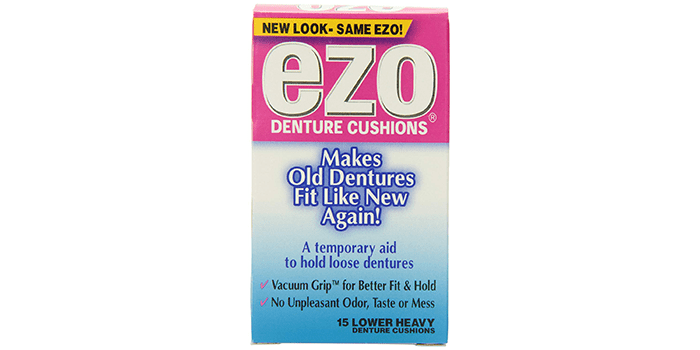 Featuring an advanced vacuum grip, the Ezo Denture Cushions make old dentures fit like they are brand new. With the ability to create a natural vacuum, this denture adhesive keeps your dentures in place and holds them in position throughout the day. Giving you a comfortable feel, it adds extra cushioning which lasts up to 24 hours. Free from fragrance, artificial flavors, and mess, this premium quality denture adhesive is crafted with corn oil and paraffin wax with its cushions made from pure cotton flannel. 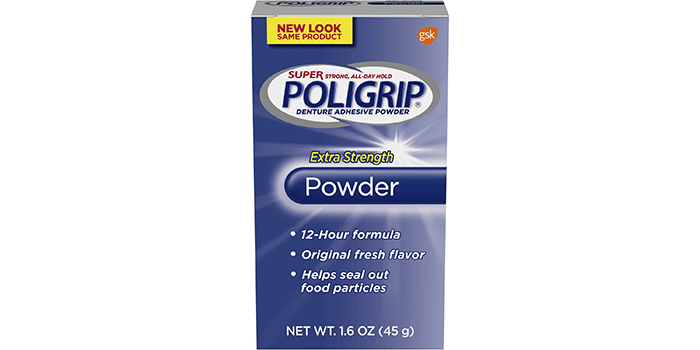 The PoliGrip Super Denture Adhesive Powder is a high-quality product that packs a unique 12-hour formula, keeping your dentures in place throughout the day. Including no artificial flavoring or added preserves whatsoever, it comes in a powder form that is convenient and easy to apply. Thanks to its special zinc-free formula, it not only offers a good grip and hold but also helps to keep out food and food particles. Ideal for both the upper and lower dentures, this box of extra strong adhesive comes with 6 packets and a strong packaging to match. Formulated to provide you with an airtight seal and a stronghold, the Fixodent Extra Hold Denture Adhesive Powder keeps dentures in place all day long. Thanks to its special powder formula, it makes it easy to apply. Considered as the number one denture adhesive brand, this product is safe to use and extremely reliable. 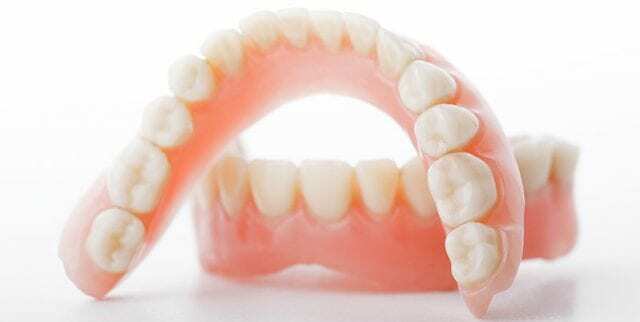 Suitable for upper and lower dentures, it can also be utilized on partial plate dentures. Alongside holding your dentures in place, this adhesive also ensures that you won’t get food particles stuck in your teeth and gums. It does so by creating a seal that locks out food from getting in. Offering an accurate hold and sealing off all unwanted food particles, the Fixodent Plus Scope Denture Adhesive Cream is a premium quality product that keeps your dentures in place for up to a whole day. Thanks to its ultra-thin tip, it allows quick and easy application. Not only does it hold your dentures in position, but it also helps in killing the germs that cause bad breath. Suitable for both the upper and lower dentures, this adhesive always works great with partial dentures. For best results and to avoid mishaps, always check the instructions on the box before applying. Free from artificial colors and flavors, the Super Poligrip Zinc Free Denture Adhesive Cream is a safe and reliable product that can be used on both upper and lower dentures. Providing a heavy-duty hold throughout the day, this premium quality cream provides a comfortable and natural feel. Not only does it provide an excellent hold, but it also ensures up to 74% of food particles are kept out of the teeth and gums. With just 2 to 3 pea size amounts applied on the denture, you are guaranteed to experience a more than reasonable hold to last you for a whole day. Popularly known for its premium quality, reliability, and performance, the Secure Denture Bonding Cream by Dentex delivers an impressive 12-hour hold with both partial and full denture wearers. Crafted with high-quality vegetarian ingredients, this adhesive is free from preservatives and 100% zinc-free. Not only does it offer a superb hold, but it also promotes oral health and keeps your teeth and gums healthy at all times regardless of your diet. Budget-friendly, convenient, and effective, this denture adhesive is one of the best of its kind, an adhesive that enjoys an increasing popularity worldwide.